Mnguni was born near Entembeni in the Stanger district on a Swedish mission station run by the Baptist church. It was here that he learned to read and speak English with some fluency. At Entembeni he met a certain Mrs Winfield whose husband was the owner of Smith and Winfield, a paint company in Durban. Mnguni worked for the Winfields and virtually grew up with their children. He worked in the Winfield business as well, and finally went to Johannesburg at the age of 25. Here he was employed as a cook until 1912. Mnguni married in 1919, moving to Imaoti in the Inanda district, where he became permanently settled. His wife was blind and they raised a large family which he managed to support by selling his paintings. According to some sources, Mnguni started painting at the age of 40 in 1925.2 This was also the year that he was noted as being ‘the first native to have his pictures hung at a recognised academy’, when he exhibited with the Natal Society of Artists.3 This suggests that he might have begun painting at an even earlier date, since his proficiency may have taken a while to develop. Mrs Winfield drew the attention of Killie Campbell to his work, and she started collecting his portraits, landscapes and representations of Zulu culture. She was especially interested in his renditions of ‘witchdoctors’ or sangomas. A number of works by Mnguni in the Campbell Smith Collection represent sangomas (see plates 7 & 9), as well as certain practices in Zulu culture such as Man taking snuff (plate 11). 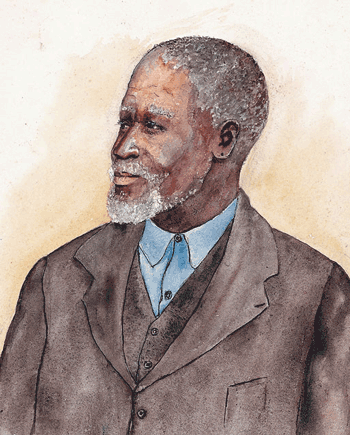 In the early months of 1940, Mnguni lost his eyesight because of cataracts but regained it through an operation with the assistance of the Natal Bantu Blind Society. Some reports hold that Campbell stopped buying his work because of the notable fall-off in quality caused by the cataracts, but by 1942 she and others were plying him with commissions, and curio shops in Durban were interested in his work. Mnguni mastered the watercolour medium and paved the way for the generation that shortly followed in his footsteps. Like Gerard Bhengu (qv. ), he was also adept at painting landscapes, and a particularly fine example of this is his Kranskop in the collection of the Tatham Art Gallery in Pietermaritzburg. His Landscape with huts and figures (plate 5) in the Campbell Smith Collection shows him in full command of his medium, conveying a sense of open space and the glare of African light. Mnguni’s portraits are delivered with impressive intricate detail. We know that he sometimes used photographs as a source for the portrayal of certain personalities, but some of his works show his affinity with the conventions of photographic portraiture. Portrait of a female Sangoma (plate 7) repeats the oval form of sepia portraits that were fashionable at the time. Most impressive in the Campbell Smith Collection are Mnguni’s two self-portraits in which he represents himself in contemporary dress. Self portrait (plate 2), painted in old age, is inscribed ‘Simoni Mnguni him Salf Native Art’. It is a study in quiet and dignified artistic self-assertion that abandons the self-effacement and binding conventions of the ‘native study’ that he was obliged to depend upon for so long. Michael Stevenson Fine Art cites a typed note dated 1940 attached to a watercolour in their stock that states that Mnguni was 76 at that date. Schlosser, K. 1975. ‘Bantukunstler in Sudafrika’. Zeitschrift für Ethnologie. vol. 100. Braunschweig. p. 51. Typed note cited in footnote 1. Born c.1865, Stanger, KwaZulu Natal; died Umlazi,1956. Training Self-taught as an artist. Exhibitions 1925: Annual exhibition of the Natal Society of Artists, Durban. Collections Iziko SA National Gallery, Cape Town; Killie Campbell Collections, University of KwaZulu-Natal, Durban; Tatham Art Gallery, Pietermaritzburg; Johannesburg Art Gallery; The Mission Museum, Hermannsburg. Simon Mnguni painted many watercolours of varying quality. Zulu warrior (plate 2) is not only a superb example of his work in excellent condition, but unusual in that he departs from his customary approach of isolating a figure or portrayal in the centre of his format (See ReVisions, pp. 344-345). In Zulu Warrior we see an integration of subject and background with the figure moved off-centre to the right. The identity of the subject is not given in any inscription, but this is an image of a very high-ranking isiKhulu or Zulu warrior, who could also be an inDuna. Rank in the case of such a man would have been indicated by the amount of decoration that he wore. High ranking warriors wore the Isidlokolo head dress, which we see here. It was made from bunching the long green to greenish black tail feathers (uPhaphe) of the Knysna Lourie and the shorter crimson to purple-metallic wing feathers of the Purple-crested Lourie. This warrior apparently also wears a secondary head dress of more reddish colour called an Isiyaya. We can also see that this isiKhulu holds a four-foot long isiHlangu, a traditional large war shield while in his right hand he holds an iWisa or knobkerrie, a bulbous-headed stick or club used to bludgeon an enemy. Under his right hand (seen on our left) is the indication of a carved wooden object, possibly a ceremonial chair, which might even indicate that the subject in this painting was of royal blood.